Let’s imagine that each website is its own environment, influenced by surrounding websites (e.g., the search engine that brought them to the site) but ultimately creating its own context, its own reality. In this way of understanding websites, a site is a microcosm, if you will — complete with norms and social expectations that are the equivalent of those in the ‘real world’ but are perhaps more… concentrated in a specific online environment. For example, the norm “people should not tell lies” still makes its way into the context of every website, but in sites, like Twitter, as a news-heavy microcosm, telling the truth is a even more important than in other environments. If that is the case, then the norms you reinforce and even create on your site will influence how your users respond to your messages. Basically, norms can actually persuade (or dissuade!) your users from acting. That’s right. 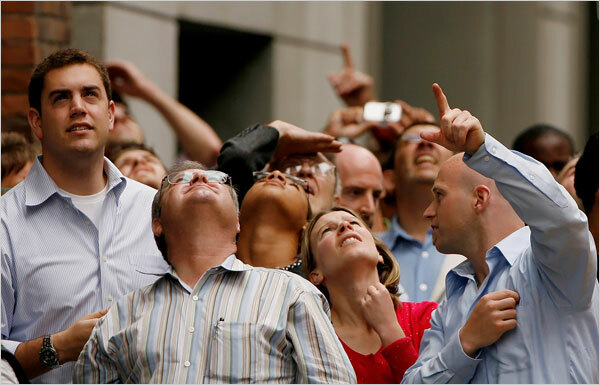 You can leverage what your users believe (social/cultural norms) in the way you message on your site to help users conduct themselves in keeping with norms they were raised with (e.g., people should say “thank you”) and the norms you highlight in the unique context of your unique online environment (e.g., people like to use our products). The idea, of course, is that people want to conform to the norms — it’s a great survival technique we’ll get into another day — so they’ll act in normative manners. It’s called normative conduct, and it’s a great way to persuade your users. Further and of great importance, when two norms are at odds in a situation (e.g., people shouldn’t litter, but people do litter in New York), people focus on the most salient or highly observable norm ‘wins’, and most will conform to that norm. 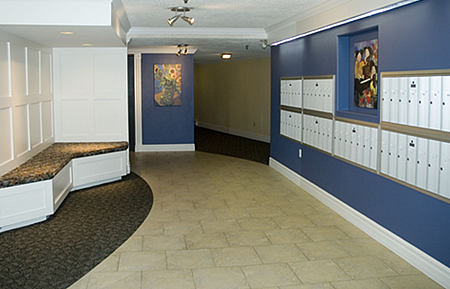 For example: There are 3 apartment building lobbies, each with a wall of mailboxes. Lobby A is very clean, suggesting “people don’t litter here”. Lobby B is very clean with a single bit of litter (actually, a watermelon rind). And Lobby C is covered in litter, suggesting “people always litter here”. The question: In which lobby will apartment residents discard their mail (i.e., litter) more frequently? What does this study show? That norms guide behavior. In this study, the norm was built around what people do regarding litter. For Lobby C, the norm was to litter, and so people littered. 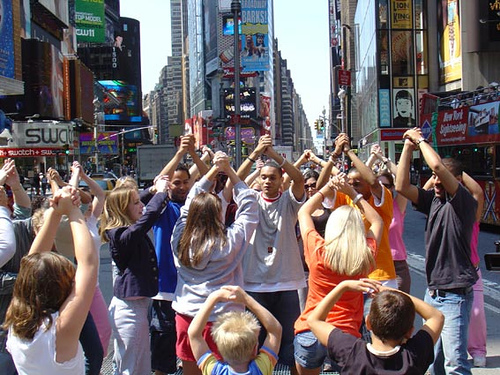 For Lobby A, the norm was to avoid littering, so people avoided it… but as soon as a few people started littering, the norm shifted to “people litter here”, and people responded accordingly. And then there’s that weird little surprise that is Lobby B. This situation saw several norms at odds: the injunctive “people shouldn’t litter” norm that sits in the back of our heads, and a conflict between the descriptive “people don’t litter here” and “people litter here” norm. In the otherwise clean environment, the injunctive norm and the former descriptive norm rose to the top, beating out the “people litter here” descriptive norm. People acted in accordance with the most powerful norms. We can take this theory beyond the litter example to the idea that a norm is ultimately an expectation of people, and when you tell people what the norm is, they are more likely to act that way. Consider that “neighborhood watch” signs have actually caused an increased perception of crime in an area and, in turn, more crime. 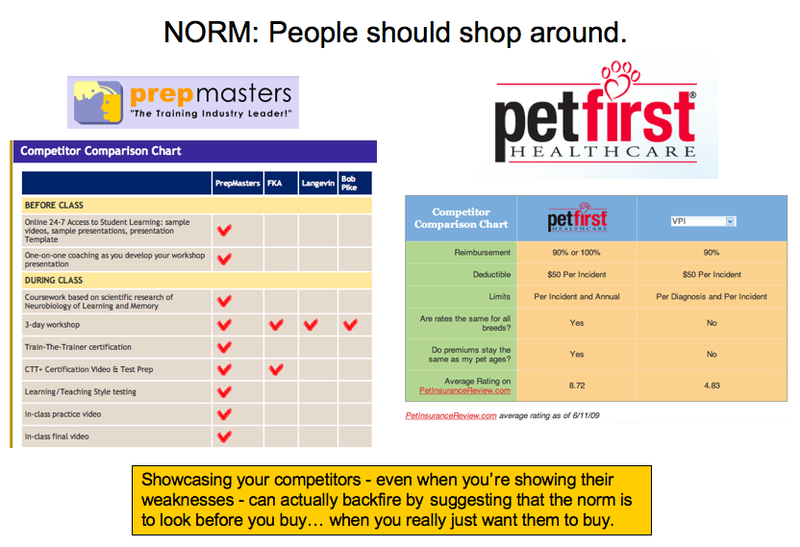 In the above examples, the comparison charts, which might normally be a great way to be transparent about how you stack up, actually create the norm that people should shop around… and that people do shop around (if not, you wouldn’t even be looking at that comparison chart, would you? )… so you, too, should shop around. Not good for conversion unless you’re 100% positive that your product will blow the others out of the water. Now, if you get normative conduct right and can create an environment in which buying your product/service is the norm and conformity is good, you’re set. Here are a few examples of websites that successfully leverage normative conduct. Do you know how you might turn your brand, product or service into the norm — without causing users to feel like real deviants if they choose not to conform to the norm on your site? It’s a fine balance… and the stuff of another post down the road. Journal of Personality and Social Psychology. 58(6), p.1015-1026.